This weekend was going to be a great navigation trip, which I’d been looking forward to because I’m really keen to get some good navigation experience. A couple of people had to pull out on late notice so there were only the three of us in the end. We hadn’t decided exactly where to go until Friday night at the railway station, but the basic idea ended up being an approximate anticlockwise loop starting and ending at Otaki Forks. I’d looked at the forecast on Thursday afternoon and it hadn’t actually appeared too bad, maybe with a bit of rain around Saturday night or so. It didn’t quite turn out that way, though. Location: Tararua Forest Park, Otaki Forks Road End. People: Allen, Marie and me. 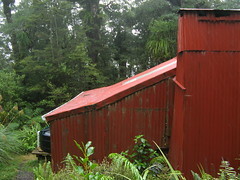 Huts visited: Kapakapanui Hut (0 nights), Renata Hut (1 night). 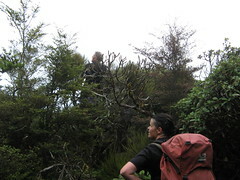 Intended route: Up the Fenceline Track to point 476 above Otaki Forks, then south-west around the ridges to Pukeatua, past Kapakapanui and down to the saddle near point 822. 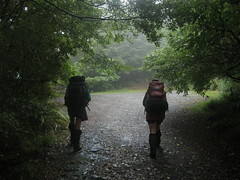 Cross the road and head on to Renata Hut for the night. On Sunday, walk along the Renata Ridge Track to point 925, and head north up the ridge for about 1km before hopping west onto another ridge and going north to Waiotauru Forks. Jump over the footbridge, and back out to Otaki Forks. Actual route: Well the first day went okay, but we ended up walking down the 4WD track towards Waiotauru Hut until we could see that the river was well up after a lot of recent (and continuing) rain. At that point we turned around, and hitched a ride out to the Akatarawa Road in a grunty Toyota LandCruiser. We arrived at Otaki Forks at about 8pm, parking at the base of the Fenceline Track rather than the main overnight carpark, and set up my Huntech Fly for the night, since there wasn’t really anywhere useful to walk to. Strictly speaking it’s a 2 person fly, but Allen showed me a trick with the Huntech fly’s which makes it much easier to comfortably fit 3 people under them. The strap which connects the two sides of the fly underneath usually clips to a loop right on the edge of the fly itself, but Allen’s trick was to un-hook it, and instead clip it onto another loop (which isn’t intended for clipping), which allows for a slightly longer strap. This allows the fly to sit about 30 cm wider at the base, and gives a bit more room for a third person to get in. (Seriously, there was heaps of space after doing that and I was impressed.) The catch is that the top will be slightly lower, but this isn’t much of an issue when you’re lying down and there’s still plenty of space to sit up. Marie and I wandered down to the toilet block at another nearby campsite (woohoo! flush toilets!) and collected a couple of billies worth of water for the next morning. Everything was set up within half an hour, and 8.30pm signalled bedtime. It wasn’t really bedtime. We had a brew. Actually, we were probably still yakking to each other under the fly at 11pm. A hunter (presumably) drove up some time early on Saturday morning, and disappeared while we were still lying in sleeping bags, leaving a ute behind. The weather looked a little overcast by the time we were up from about 6.15’ish, and it didn’t change a lot during the next 90 minutes of our relaxed brekkie and packing up. We began by heading clockwise up the tourist loop track known as the Fenceline Walk. Roughly 100 metres vertically up the hill, we left the main track, onto a well walked route up a spur which ends just north of point 476. The route up this spur switches quite a bit, but generally it’s heading north west. We ended up standing around in a clearing at about point 476, or nearby it, checking the map and trying to think of ways to confirm that that was about where we were, since it wasn’t completely obvious. We’d really wanted to go south-ish from here, but there wasn’t any clear way to do so through a dense barrier of trees. The most obviously walked route seemed to be continuing north-west. This issue was quickly resolved as soon as we noticed that the track in front of us turned abruptly south into a gap, followed by a wide open clearing, after about another 20 metres. The Terramap for the Tararuas also indicates a small tarn near here, which we walked past at about 8.45am, even though it resembled more of a mud pit with extra high grasses. The route continued straight from the opposite side of the clearing, and for some time we were able to continue along the ridge in what was a fairly good track, both out in the open and when it went under trees. There are a couple of places along this bit of ridge where it’s necessary to veer around towards the west, rather than the usual south-west, and fortunately this was where the track led us although for me at least, I was trying to keep an eye on my compass bearing to make sure we were going where I thought we should be going. The most difficult part of the stretch was in the vicinity of Pukeatua (point 812), at which point we wanted to go straight west rather than accidentally heading down any of the spurs that surround it. Allen looks for an opening. By 10.30am, the unofficial track that we were on had led us to a small clearing surrounded by dense growth, and no apparent way out. At this point, Allen dropped his pack and climbed a short way up a tree for a look around, but was unable to see anything obvious, so we decided to back-track a little. This wasn’t too concerning because we already knew there was at least one other possible side-track that led west-wards not far back. I’d almost walked up it accidentally, without even noticing that the most heavily walked track had continued over the top of a gully (shown on the map as the head of a stream) just north-west of Pukeatua. We didn’t even have to go back properly, because as soon as we’d withdrawn from the clearing the trail of occasional snapped branches indicated that others had already bashed through in the general direction. At 10.45am we were back in a place that looked quite familiar to where I’d reached before, and noticed that it’d even been marked with a couple of orange ties on nearby branches. After a short break for some scroggin, we picked up the trail once again. The ridge west of Pukeatua briefly took us into the open, and I made an embarrassing mistake of following a ridge almost directly south. I’d even been following my compass bearing at the time, but somehow had momentarily gotten into my head that I was supposed to be going south rather than west, and I didn’t realise this until Allen and Marie yelled out to ask where I was actually going. Our destination from here was Kapakapanui, which means it’s necessary to head south after about 1.5 kilometres. On the map it appears that the westward ridge runs out at just about the right time to turn south, but we did still find several places where other side tracks wandered off in alternative directions, presumably down other spurs to the north and so on. Consequently it turned out to be necessary to keep a close eye on the bearing when following the route, and occasionally check ahead to find out where the various off-shoots were actually going before making a proper decision. The point that we needed to head south was very clearly marked by no less than 6 markers of various types on nearby trees. This was very helpful too, because the obvious route continued to the west, probably about to veer slowly north-west and then north, towards another ridge in which we had no interest. By now the overcast sky had turned into a consistent drizzle, no doubt a sign of things to come. 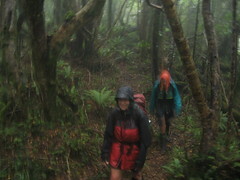 Even though we were sheltered to an extent underneath the trees, we were starting to get very wet by 12.45pm when we stepped out in front of a large orange triangle along the loop track just above Kapakapanui Hut. 5 minutes later we were entering the hut, and sat down for some lunch and a short brew. 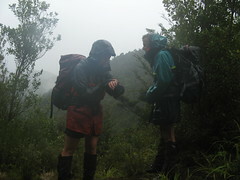 It was an hour of sitting around and chatting before we left, following the track up the hill to Kapakapanui Trig, at which we arrived 40 minutes later. Typical views from the Kapakapanui Trig are expansive both towards Kapiti Island on once side, and over in the direction of Kime Hut on the other side. Today it was just white in all directions, and also windy. 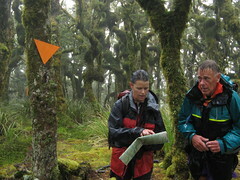 Immediately after the trig, we arrived at the signposted turn-off down along the ridge towards Renata Hut. The route down towards Renata is clearly signposted at the top, and it’s an orange triangle route the entire way down, beginning out in the open before descending underneath a tree canopy for the majority of the ridge down towards the saddle. I was a bit surprised, however, to find that for an orange triangle track it was probably the most overgrown route we’d walked on all day. It did get better after the first part though, once it had flattened out a bit. Having left the turnoff at 2.25pm, this part of the walk lasted nearly a couple of hours before we reached the saddle, which is also an intersection between our own track towards Renata Hut and the 4 wheel drive road that comes in from the Akatarawa Road towards Waiotaru Hut. Allen commented that this specific area had once been surveyed for a school, back when Odlins owned the land and had plans to build a logging settlement. The initial road was built, but the settlement never went ahead after it was decided that the timber in the area wasn’t actually worth that much anyway, or something like that. My recent Terramap shows that the road becomes a walking track between the saddle and Waiotaru Hut, but it’s actually a 4 wheel drive road for that entire distance. 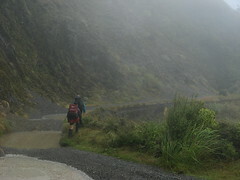 It was raining steadily out in the open, so rather than hang around getting wet we quickly hopped over the road into the track on the other side, and we were back on our way to Renata Hut. The three of us finally reached Renata Hut at 4.50pm. After hanging up our soggy raincoats and soggy socks and soggy shirts and soggy gaiters and soggy shorts and soggy undies and putting out our soggy boots, we eventually got some dinner sorted, which was an assortment of mixed vegetables, bacon and soy-based vegetarian bacon pig-flavoured dog biscuits… which weren’t actually too bad. It was starting to get dark earlier by this time of year, despite the extended daylight savings, and we went to bed not too much longer after dinner, continuing to gossip for another hour or so as the candle near the window slowly burned down and went out. The rain continued all night, almost persistently. I woke up on one occasion and it sounded as if it had died off, but this didn’t last for long and it’d started again the next time I was awake. When the light finally did begin to seep through the roof, I didn’t feel very inclined to drag myself out of bed at all, but I convinced myself once it became clear that Marie and Allen were both slowly getting themselves sorted out. So after a quick and informal breakfast, and after putting away the dry clothes and putting all our soggy clothes back on, we eventually made it back out the door. It now seemed unlikely that we’d be able to go through with the day’s plan, which was to head towards Eldar Hut and then walk along the ridge from point 925 towards Waiotauru Forks. Instead, we started thinking about alternative plans. The most obvious idea was to try to get around to the Forks via the main track instead, past Waiotauru Hut. Another obvious way out was along the 4 wheel drive track towards the Akatarawa Road, although then we’d need to try and get a phone call out to get collected, or wave down a passing car. Both of the maps we had (the LINZ map and the Tararua Terramap), the latter of which is only a year old, show a footbridge right next to Waiotauru Hut. Allen, however, who gets around a lot and is generally more reliable than a map, was very sure that there was no such bridge. I still haven’t been there to check but after asking around a couple of other reliable sources since we returned, it sounds as if he’s correct. At the moment at least, there’s apparently nothing more than the remains of a washed out bridge next to Waiotauru Hut, despite what is indicated on the maps. Allen gazing at a dirty river. Having left the hut at 9am or thereabouts, it wasn’t much more than a 30 minute climb back to the saddle intersection with the 4 wheel drive track, and the first place where we’d need to make a decision. We had the entire day ahead of us at this point and it was preferable to get ourselves out if we were able to, so we began walking down the hill towards Waiotauru Hut. After an hour of walking though, we got our first view of the river and decided there and then that we did not want to try and cross that river. With the amount of brown much flowing through it, there was no way we’d get through it safely. Returning to the saddle (again). Once we reached the saddle again at 11.35am, it was the third time we’d visited it in the past 2 days. On this occasion, we continued to follow the 4 wheel drive track generally south, down the other side, hoping that at some point we’d get some mobile reception and be able to call someone in town to arrange for a collection in about another 3 hours or so. Literally 5 minutes after we left the intersection, though, there was a face poking around the corner. We hailed the guy, noticing as we approached that he had a rather big Toyota Landcruiser parked just around the corner. A few metres further, and we discovered that it wasn’t just him — there were more of them: 3 vehicles and 6 people out playing in the mud with their big grunty snorkel-equipped toys. It was an unofficial trip by several members of the Wellington Cross Country Vehicle Club. Walking out to the Akatarawa Road. The 6 of them were on their way up to the saddle and planning to do some other side tracks, but offered us a backup plan to possibly give us a lift back to civilisation if we were still stuck by the time they’d turned around and come back. We’d thought we might have actually been out at the road by the time this happened, we must have been only about half way. We were all a bit sick of walking by this point; besides the general enjoyment of tramping, I personally find walking along roads to be a bit boring. So we took up their offer of a lift, and some visits down some side tracks, and got a neat ride out in a genuine 1980’s Toyota LandCruiser. This was a treat, and personally I enjoyed seeing 4 wheel drives vehicles actually being used for what they’re supposed to be used for, instead of just burning fossils to collect children from school and blocking my view on the road. The two people who collected us had been in the country for 6 months, had been up here 3 times now, and have apparently collected trampers every time. Perhaps this has something do with their like of mud and visiting the place after heavy rain, but that’s just a guess. We were expecting to just get a ride out to the Akatarawa Road, or at best to Waikanae, but in the end they were kind enough to give us a ride all the way back to Allen’s car at Otaki Forks. It’s great how people will help out in situations like this, and it was an unexpected end to an interesting weekend trip. At least there was no need for a shower when I got home. This entry was posted in tramping and tagged bagged:kapakapanui hut, bagged:renata hut, change of plans, navigation, tararuas, tramping, wellington tramping and mountaineering club. Bookmark the permalink. Sounds like an interesting route! Out of interest, was that Fenceline to Kapakapanui route marked on a map or was it just improvisation? I see. Well I’m definitely not ready for that one yet! I’m looking to get back in to tramping gradually as I haven’t really done much since my scouting days. I’m particularly interested in Mt Kapakapanui as I can see it from my house in Paraparaumu. I’ll probably attack it from the Ngatiawa Road side rather than via Otaki Forks! That first day was a very good effort indeed. Ive done a similar route myself. From Elder biv down into the snowy is another great one. Theres alot of old logging trails and some great river flats.